In contemporary linguistics, both cognitive and critical approaches to language have been elaborated in some detail. Unfortunately, the two perspectives have seldom converged, despite the potential theoretical advances such collaboration offers. 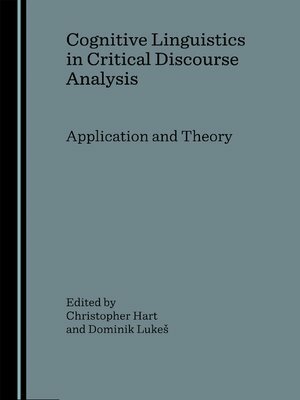 The contributions to this volume explore the convergence of cognitive and critical trends in the guise of cognitive linguistics and critical discourse analysis.The volume addresses a range of socio-political discourses in various international contexts, including discourses on nation, education, immigration, and war. One single integrated model is not presented, but rather, a number of methodologies are developed and assessed across the chapters. The application of established cognitive linguistic theories, including conceptual metaphor theory, conceptual blending theory and frame semantics, are discussed, as well as developing theories, such as metaphor power theory and discourse space theory. The book is of value to anyone interested in the interaction between language, mind, and society, including both students and scholars of cognitive linguistics and critical discourse analysis.